This week we have eaten our way through an orchard of apples. Apple chips, (dehydrated apples), apple sauce, apple juice and today, apple crumble. Not only have we eaten apple, we have also been reading a bushel of apple books. One of my favourites is Ten Red Apples by Pat Hutchins. It qualifies as a Perfect Picture Book for Friday. Ten read apples hanging on the tree. 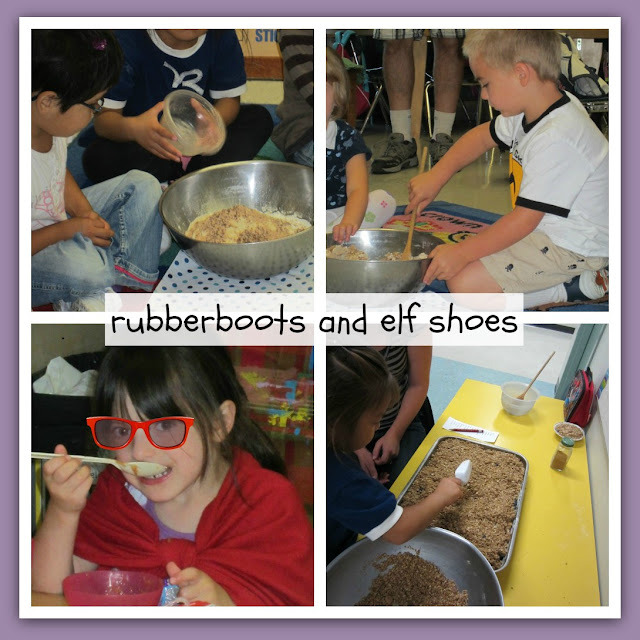 A concept book that blends rhyming, counting, repetition and animal sounds into a charming, folksy story. Hutchinson's trademark wooden figures ... populate this delightful tale in which the farmer watches the animals eat bright red apples from the tree... When there is just one apple left, he picks it. Then along comes his wife who finds "No red apples to bake in a pie". The farmer saves the day when he finds another apple tree and they fill the basket with "More red apples hanging on the tree". 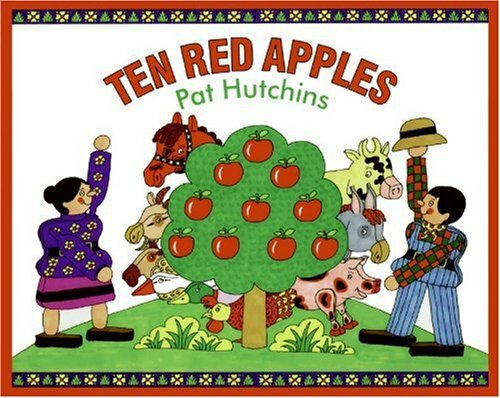 Ten Red Apples has a lovely rhythmical text that bounces along from apple to apple, animal to animal. It's fun to read aloud. And the kidlets love to join in. 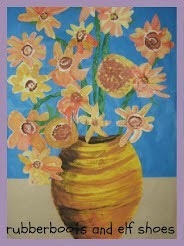 The fun and cheerfulness of the text is reflected in the illustrations. The gouache paintings, framed bright red, depict brightly coloured hinged wooden characters. My kidlets liked seeing the collection of apple consuming animals increase on the right side of the book. Then one observant little kidlet saw that the next animal to visit the apple tree was hiding behind the farmer. That revelation demanded some careful re-reading of the pictures. The School Library Journal summed it up well: A delicious selection from a master of simplicity. 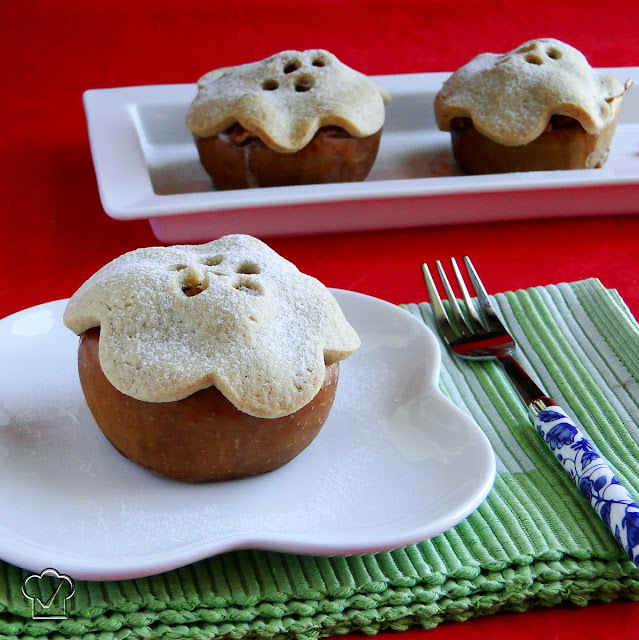 Kelly from Little Wonder's Days put together this Ten Red Apples tray for her 4 year old twins. Love the Cheerios for the apples. 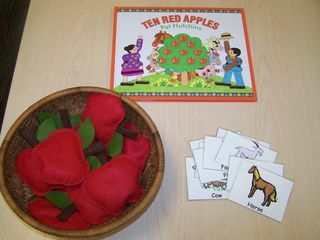 Laura from My Montessori Journey sewed these beautiful apple bean bags to go with animal cards for retelling the story. Michelle at Hubbard's Cupboard created the animal cards as part of a unit on apples. Scroll down through some other wonderful apple activities to find the animal cards pdf. 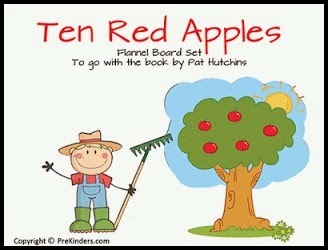 Prekinders has a Ten Red Apples flannel board printable set to download. I have printed flannel board sets on t-shirt transfer paper and ironed them onto white felt, or I have printed them on paper, laminated and used them for story re-telling as is. The farmers wife made pie with her apples. We did not make pie, but we did make apple crumble today. Pretty yummy! If you were to make apple pie like the farmer's wife, this one from Testado, Provado & Approvado looks pretty fun. Your apple activities look like SOO much fun! What are you going to make, Barb? 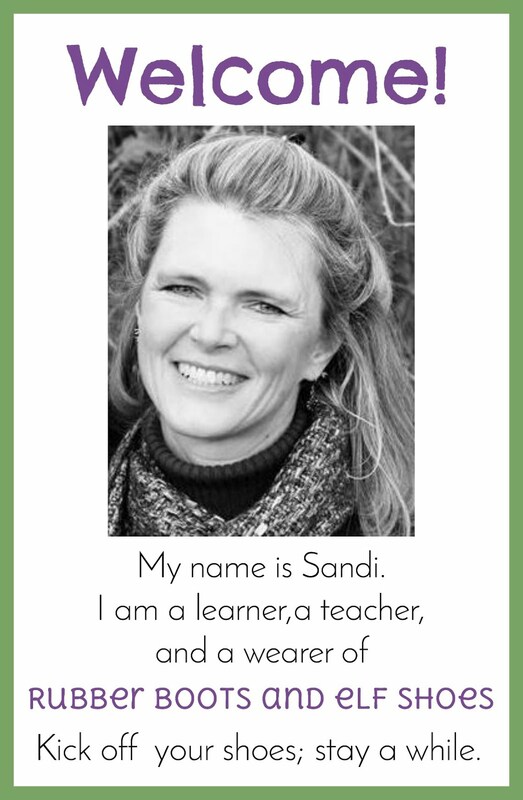 Sandi, I love it when you can tie a book into activities with kids. Like the rhyme. You have really awesome activities. Loved the pictures. Yum! What a delicious week! This is by far one of my favorite books. I read it constantly to my own children. I made up a very catchy tune. Someday when I visit you I will sing it for you. 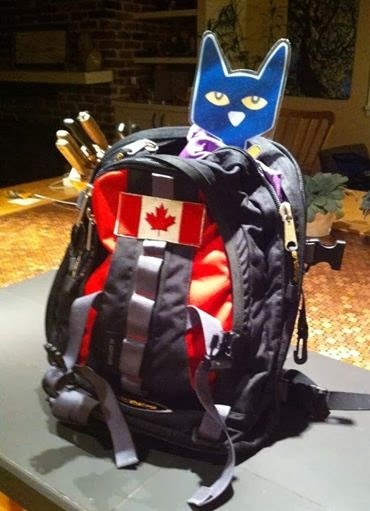 There is never a post I read from you doesn't make me want to be in my own Kinderarten class. I haven't been able to figure out a tune for this book that works. So, you need to head over to this coast and sing it for me! !